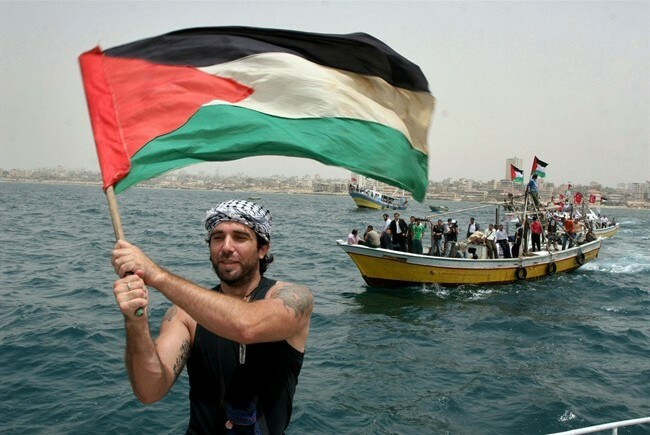 On the morning of April 16th 2011, exactly three years ago yesterday, the body of Vittorio Arrigoni was discovered inside an abandoned house in northern Gaza. He had been strangled to death. Two days previously, Vittorio Arrigoni had emailed a friend informing him that he would be delaying his departure from Gaza until Israeli airstrikes had settled. He had to be sure that the people of Gaza knew he would not abandon them. Just 48 hours later, he had been murdered. A short time after the 36 year old activist and journalist had been kidnapped, a video had surfaced online showing him blindfolded and apparently bleeding. His captors, members of a small Salafist terrorist group called Tawhid wal-Jihad, addressed the Hamas authorities dictating the release of their imprisoned leader, Walid al-Maqdasi. If demands were not met within 30-hours, they declared, Arrigoni would be executed. For an unknown reason, and despite a frantic manhunt by Hamas security forces, the group carried out the execution before the deadline had passed. As word spread across the Gaza Strip that a body had been found, hundreds of Palestinian people, confused and angry, openly mourned the loss of a man who had lived among them, suffered beside them, and told their story to the world. Since leaving school, Arrigoni, or Vik as he was known to his friends, had been part of human rights projects across the globe. From Eastern Europe to Africa, he immersed himself in volunteer work. It was after a trip to Jerusalem in 2002 that he decided to focus his time and efforts on the Israeli-Palestinian conflict. Arriving in Palestine later that year, he began what would become a decade of committed activism. First and foremost, Arrigoni was a humanitarian. His compassion for the Palestinian people led him to join the International Solidarity Movement (ISM). In 2008, with fellow ISM members, he joined a Free Gaza flotilla aiming to break the Israeli blockade placed on the Gaza territory when Hamas had seized power the previous year. A believer in non-violence and human rights, Arrigoni had openly criticised the ruling authority Hamas, amongst other islamic extremists, accusing them of “deeply limit[ing] human rights since they [had] won elections”. His pacifism aligned him with the normal working people of Gaza before anyone else. In the years that followed, he acted as human shield for Palestinian fishermen, becoming injured, and on other occasions arrested, by Israeli authorities. Fellow ISM volunteers recall Arrigoni fearlessly stand while Israeli snipers fired warning shots, kicking up dust only metres from his feet. Death was a real threat, he understood this. However, being a strong critic of the Israeli policies that impacted farmers and fishermen meant immersing himself in their struggles, not only witnessing the pains of conflict but suffering under them. Living amongst the residents of Gaza, he became a friendly face, part of the vibrancy of the culture. Arrigoni could often be seen wandering around chatting to shop owners, laughing, smoking his pipe, wrapped in his shemagh. He is fondly remembered by Palestinian youths who recall smoking shisha with him and being counselled by him. They call him brother and a friend. Connecting to the humanity of innocent Palestinian families, he couldn’t help but begin to tell their personal stories. His writing reached prolific heights during the two months of Israeli Operation Cast Lead. Between December 2008 and January 2009, Arrigoni became an important source for both Italian and international media. Israel had begun a bombing campaign, targeting police stations and suspected weapon caches in reaction to ongoing rocket fire. The RPG fire had, in turn, claimed the lives of over 110 Israeli’s since 2005. The situation had become even more tense since Islamic group Hamas had violently taken power in 2007. The cycle of violence was ever turning. Arrigoni’s courageous coverage of events inside the sieged 25 mile long strip documented the complete 22 day bombing campaign that saw over 1200 Palestinian civilians killed, including 400 children. His desire to record the true horror of Cast Lead, flagging that truth to the media, stemmed from his deep solidarity with the every day man, woman and child. Posting his stories online and pushing them out through social media, Arrigoni would sign off each entry with the words &apos;restiamo umani&apos;, or ‘stay human’. As of April 2011 however, the brutality with which he was murdered, and the overshadowing senselessness of it, highlighted all the more the weight of conflict when it has a human face. Something that Arrigoni wished to communicate to readers in every article he wrote. Were it not for his determination to stay, as noted on the email to his friend on April 13th, Arrigoni may still be here with us. However, postponing his departure speaks for him more than another ten more years of work. The redemptive nature of Vittorio Arrigoni’s work, sacrifice and journalism continue to inspire today’s youth in Gaza - and beyond. He’s the object of street art, rap lyrics and has even had a street named after him, so legendary is he in stature. To Arrigoni though, activism and solidarity were embodied in the simple, everyday steadfastness of friendship and community. Whether received as a martyr, reporter or friend, it is with the phrase &apos;restiamo umani&apos; that many will affirm his legacy, three years on. Until peace. "Rockets Into Israel Are The Legitimate Resistance Of A Desperate People"